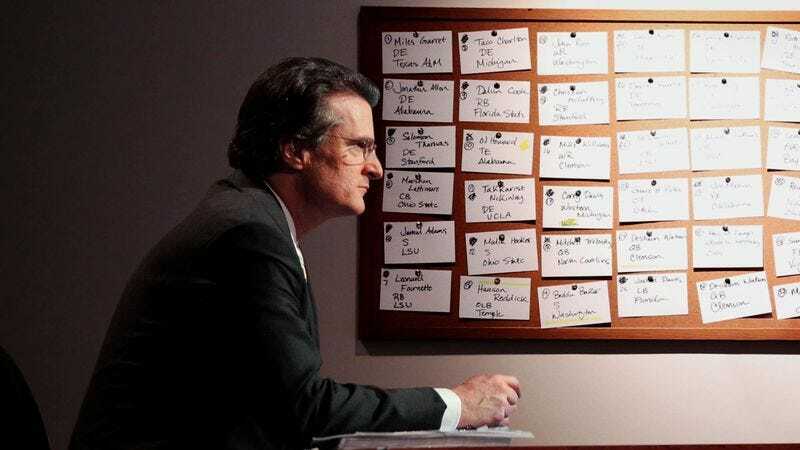 BRISTOL, CT—Seeing the rolling corkboard in a way he never had before, ESPN analyst Mel Kiper Jr. reportedly shrugged off amorous feelings toward his 2017 NFL Draft Big Board while working late one night in his office, sources confirmed Tuesday. “We were capping off another marathon workday with a few drinks, which turned into a few more, and the next thing you know we were inches apart and I wasn’t sure I could resist exploring this sudden, undeniable attraction,” said Kiper, adding that working so closely side-by-side for months in preparation for the Draft had slowly eroded the courteous professional distance he had always maintained with the 10-foot-wide bulletin board used to catalog and rank NFL prospects. “Did my mind wander in that special moment to what could have been? Sure. But then I thought of my wife and my daughter, whom I love more than anything in the world, and I remember why I stopped it from going further than a kiss.” Kiper also admitted to reporters that the amount of time fellow analyst Todd McShay has recently begun spending with the Big Board has started to make him jealous and even paranoid.